Something different to read from the mouths of moms. Here's something completely different: a parenting book that’s as entertaining as it is informative. Words come easily to Sam, a carefree kind of mom; and Lee, an orderly mom to multiples. Their book is based on a series of e-mails sent to each other in trying times. 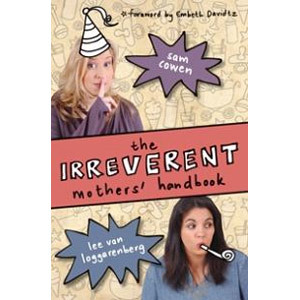 Funny, touching, but mostly… irreverent… Moms the world over will relate to these candid conversations. Parenting experts like Ann Richardson, Meg Faure and Sheryl Cohen balance the hilarity with sound advice. The style is sometimes trite and contrived. Did Lee really use a disposable nappy when she ran out sanitary towels? Did Sam really pick and eat a rose in a moment of mommy madness? I’ve yet to finish the book – from the middle onwards each page just reads like more of the same.